Previously named SwipeStox, Naga Trader is a diversified trading platform that enables users to trade with crypto and fiat, plus a wide range of CFDs including stocks and more. The focus of Naga, however, is that one can automatically copy the trades of leading Naga Traders on the platform. Armed with the premise that anyone can trade, Naga Trader offers a protective feature that limits risk and an AI-powered personal investment advisor. Leading traders can become influencers, earning money per each copy they garner and enjoy other perks such as the fee-reducing Naga Coin (NGC). In this ecosystem, novice and experienced traders benefit from one another as they master the market together. 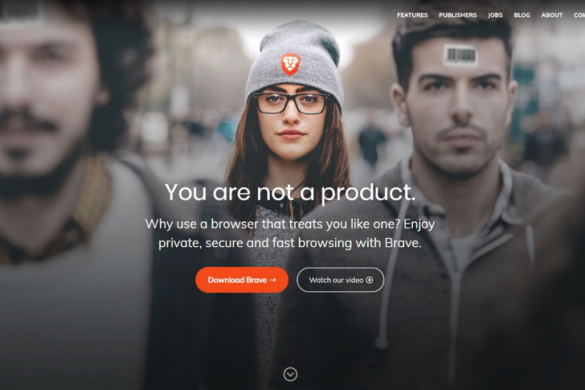 Security: Is It Safe to Use? Joining Naga Trader is straightforward and fast. To sign up, go to the Naga Trader website and click on the Sign Up button on the upper right-hand corner of the page. 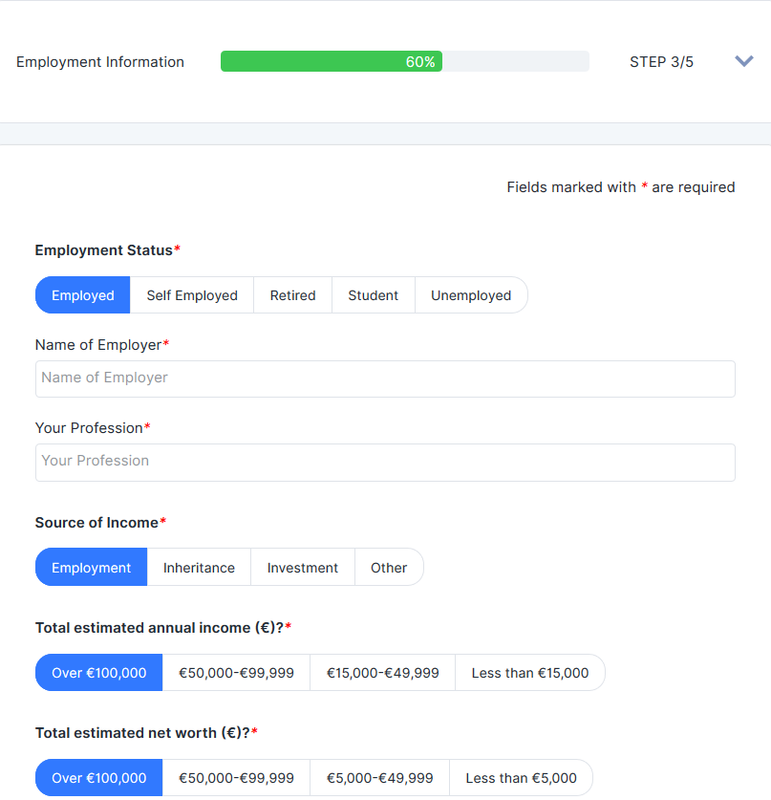 You can choose to sign up with personal information or to connect to the platform via your Facebook or Google accounts. Once you’ve completed this step, you can test the Naga Trader platform using a demo account. To start live trading, you’ll need to fill in a more detailed personal information form, including basic details and cellphone verification, which is accomplished by SMS authentication with a 4-digit pin. Once you’ve authenticated your number, you’ll have to provide further details about yourself, first about your nationality and place of residence, followed by employment status, income, and investment expectations. Finally, you complete the verification process by providing a proof of residence (such as a utility bill) and a proof of identity (including a license, a passport, or another type of government-issued identification). Once you’ve concluded the verification process, you’ll be able to deposit funds into your account. However, until you complete all the Know Your Customer verification steps, you’ll only be able to deposit up to $2,000. 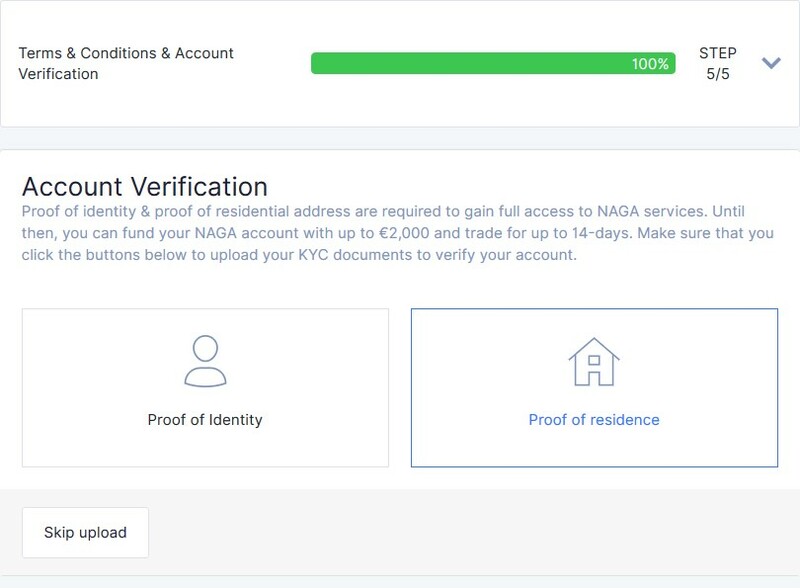 One of the advantages of Naga Trader’s KYC process is its quick turnaround: registration is only supposed to take between 8-24 hours from when the company receives documentation. 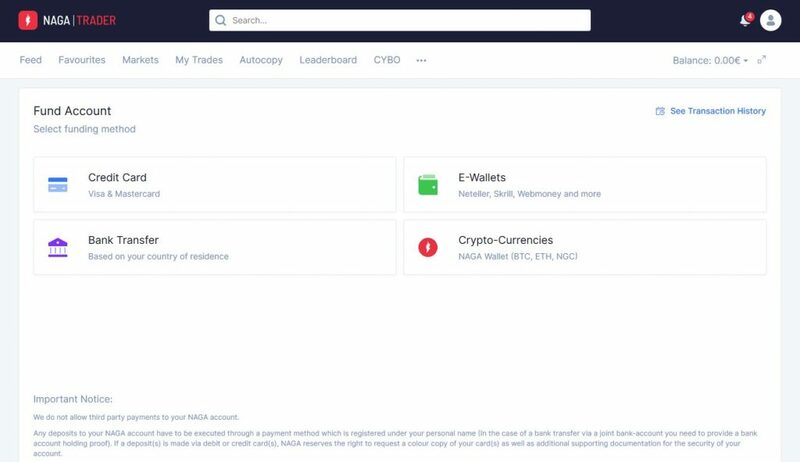 To deposit funds to your Naga Trader account, look for the profile icon at the top far-right corner of the screen, above Naga Trader’s dashboard. You can choose from myriad funding options, such as credit card, bank transfer, e-wallet options, and blockchain wallet transfers of crypto. Now choose the amount you’d like to deposit, and click on the submit button. If you’re using an e-wallet or crypto wallet, you’ll have to designate the origin of your funds first. After that, all that remains is to wait for the funds to appear in your account once the transaction has been executed and then verified. The withdrawal of funds from your account is just as easy. Select a wallet to withdraw funds from (most likely your Naga wallet) in the same area as the Deposit option and then choose the payment method you would like to use. After you’ve successfully deposited funds in your account, you can start trading. To begin, click My Trades. In this tab, you can view past trades and active trades—trades that have been opened but not completed. After you click on a pair, a new window will open with an interactive chart detailing the performance of that CFD over time. You can choose the period you want examine, from a single day to five years. A feature that should interest new traders that are just starting to test out the waters is the NAGA Protector, which enables users to set limits on how much they can gain or lose on a given trade. To activate the protector feature, look to the bottom left corner of the trade window you’ve opened. Set the amount and rates you prefer and turn the blue button to On. 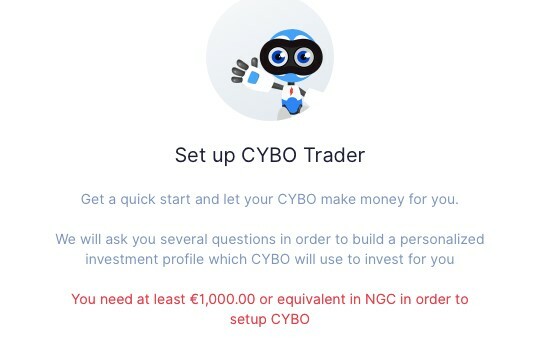 Another feature that makes Naga Trader a smart choice for inexperienced traders is CYBO, a robo-advisor option available to users since late 2017. After clicking finding CYBO on the dashboard, you answer a number of questions to gauge your investing preferences. CYBO then begins to invest on your behalf, 24/7, based on the information you’ve provided. 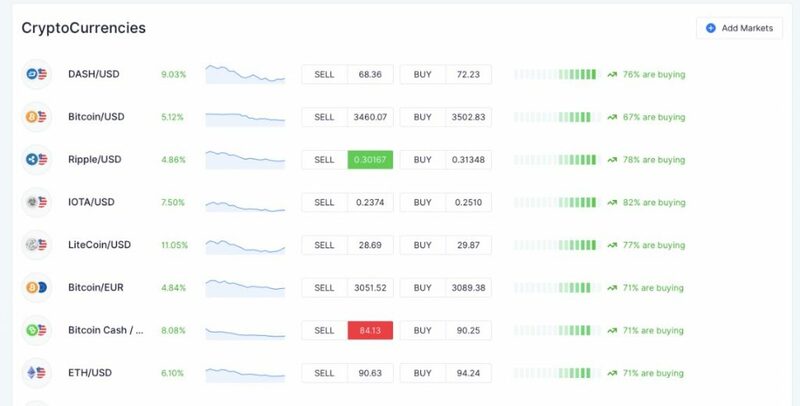 One of the best parts of the platform is without a doubt its easy-to-use autocopy feature, which makes it simple for new traders to follow the trading strategy of high-performing traders on the platform. To access this feature, check out the Leaderboard button on the dashboard. The window that opens shows you the top three current traders, followed by a list of the rest of the top 100. Each trader has their aggregate profit/loss, number of autocopiers, and number of trades listed next to their names. 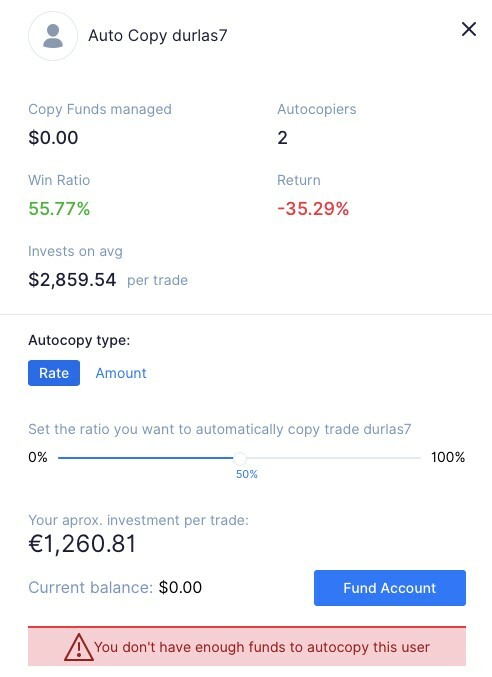 To automatically copy any of these traders’ trades, simply click on the autocopy button attached to their listing, and set up the funds ration to determine how much of your funds you would like to assign to that particular user. Naga Trader accepts customers from over 200+ countries. In keeping with their customer-first ethos, the platform currently supports 8 languages: English, Spanish, German, Polish, Czech, Italian, Hungarian, and Portuguese. Just as importantly, their customer support languages include Arabic, Czech, English, German, Italian, Polish, Spanish. Their short list of countries with restricted access to the platform includes Canada, Belgium, China, Iran, Israel, Japan, North Korea, Sudan, Syria, and Yemen. 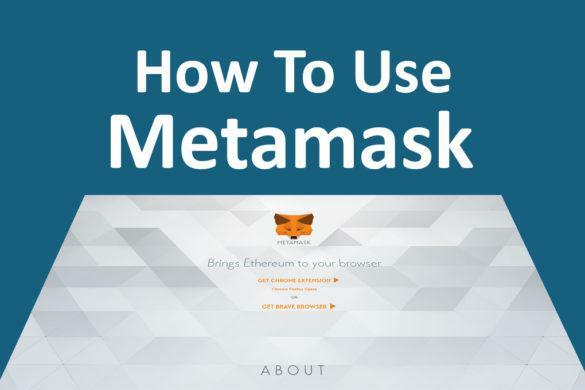 However, due to US regulations regarding transactions and securities, customers with a US nationality or residence are prohibited from using the site at all. Naga Trader has a small but substantial collection of cryptocurrencies on offer, such as the popular Bitcoin (BTC), Litecoin (LTC), Ethereum (ETH), and (Ripple), as well as more recent coins, such as Bitcoin Cash (BCH), Dash (DASH), NEO, and IOTA, as well as of course its own Naga Coin (NGC). Naga Trader gets extra points for its modest fee system. Fiat deposits on Naga Trader are free, as are many forms of withdrawal, including credit/debit card, and as withdrawals to e-wallets Skrill and Neteller. However, many of their bank transfer options include a small fee that users should be aware of. 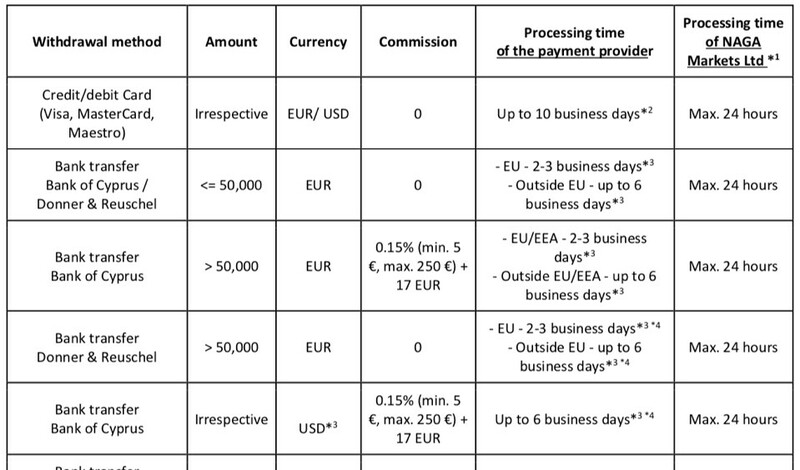 For instance, a bank transfer to the Bank of Cyprus that is less than 50,000 EUR or any dollar amount will incur a 0.15% fee, at a minimum of 5 EUR and a maximum of 250 EUR, plus an addition 17 EUR. In terms of trading fees Naga Trader adds their small fee into the spread. Traders that reach the Gold, Diamond, and Crystal trader levels are rewarded with 50% less in trading fees. The company also incentivizes traders to use its own utility coin, NGC, through a series of rewards including 50% off trading fees for each trade they enact on Naga Trader. NGC traders also earn a percentage based on the platform’s trading volume, and can also double the bonus you get for copying traders. At present, Naga Trader doesn’t have any limits imposed on cryptocurrency deposits or withdrawals. It has set limitations on fiat money: the minimum amount you can deposit via a credit or debit care is 1 EUR/ 1 USD, and the maximum you can deposit is 10,000 EUR/USD. Naga Trader doesn’t have a limitation on how little withdraw in fiat, but it will stop you from withdrawing more than 10,000 EUR/USD in a single go by credit or debit card. With rookie traders in mind, Naga Trader’s payment methods are a soft landing for anyone just getting interested in cryptocurrencies. While you can fund your account with a number of cryptocurrencies, you can also use e-wallets, bank transfers, or debit and credit cards to top off your account. Naga Trader is a secure social trading platform, and it works hard to maintain its safety through a number of methods and tools. On the user side, Naga Trader encourages its users to adopt 2-factor authentication. In May 2018, the Naga Trader app achieved another level of security with a facial recognition verification process that is fully automated. On the company side, the Naga Wallet’s data storage is decentralized, and it too uses multi-factor authentication, making it an extremely safe destination for storing cryptocurrency. In addition to consulting with leading white hacker firms on a consistent basis, the company also runs frequent internal hackathons to detect vulnerabilities in the system. To date, Naga Trader’s uncompromising approach towards customer safety has kept the platform hack-free. 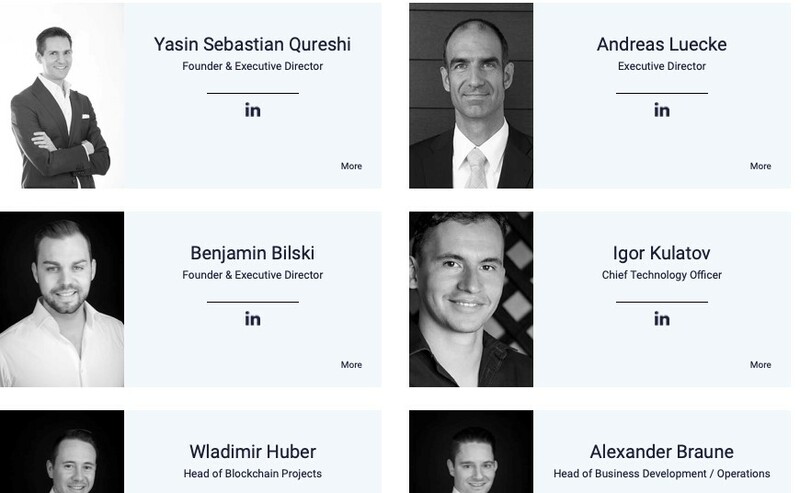 The team is helmed by Benjamin Bilski, Yasin Sebastian Qureshi, and Andreas Luecke, whose combined expert experience in finance and technology has made Naga Trader one of the most exciting trading products on the market. Naga Trader secured the 4th position in our Best social trading platforms roundup. Naga Trader is known as a groundbreaking social trading platform among cryptocurrency experts and novices alike. 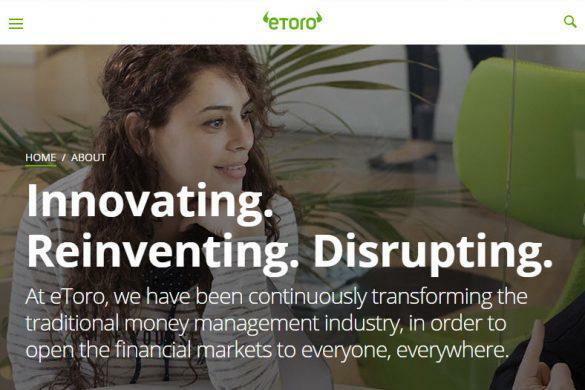 The company’s revolutionary approach to the social trading model has landed them some of the industry’s most sought-after awards, including FinovateEurope Best of Show Award 2016 and Red Herring´s Top 100 Europe Award 2017. 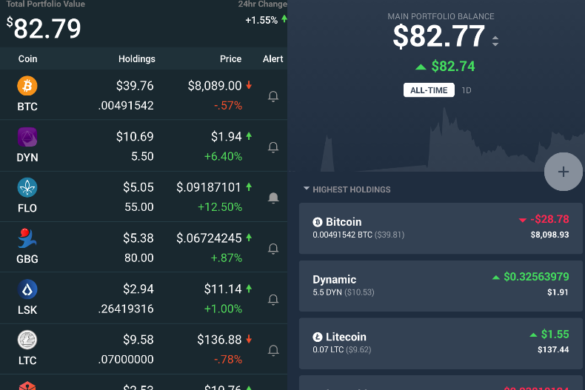 With innovation and user experience as its top priorities, Naga Trader is one of the most accessible social trading platforms available today. @2018 - ChainBits. All Rights Reserved.